We take a multidisciplinary approach to cancer care, bringing together a wide range of skilled doctors, nurses and allied health professionals. For our patients, this means access to the very best of treatments and experts available, as well as comprehensive information and support, all delivered within the one integrated cancer care plan. Radiation therapy is an effective and important part of management for a range of cancers. The prospect of radiation therapy can be a mysterious and even frightening thought for many individuals. This website has been designed to relieve some of your anxiety by helping you understand more about radiation therapy and walk you through the practicalities of undergoing radiation therapy. The Chris O’Brien Lifehouse radiation oncology department is at the forefront of cancer care and research in Australia. Our vision and mission is to deliver to our patients and those who care for them innovative, effective and compassionate cancer care and support, according to the best research evidence. This is achieved through the development of a coordinated, multidisciplinary team of highly talented and motivated people working in clinical care, research, education and psycho-oncology. We are equipped with a wide range of radiation therapy services, up-to-date technology and have a dedicated and experienced team who work to provide the best care for all patients. What happens in radiation oncology? Radiation therapy is the use of high energy x-rays to kill cancer cells. 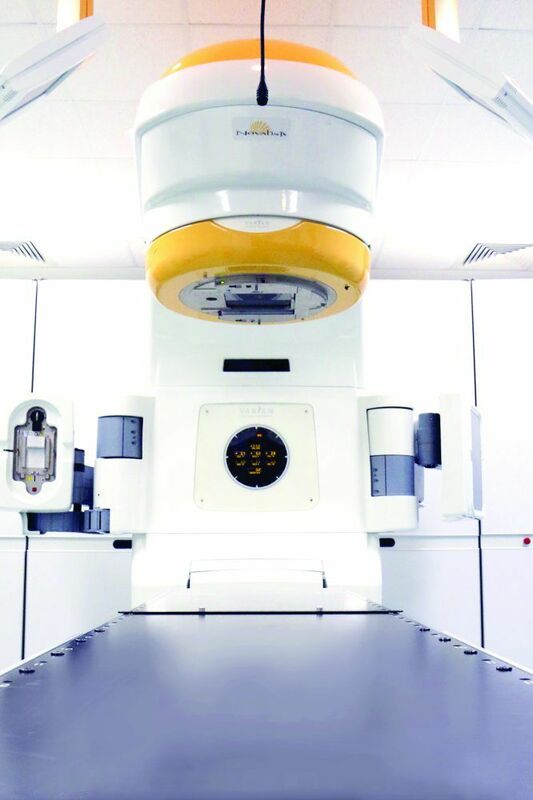 Modern radiation therapy techniques focus on accurately and precisely targeting the cancer whilst sparing the normal body organs around the cancer as much as possible. Chris O’Brien Lifehouse aims to provide affordable care to all patients. Radiation Oncology is an outpatient service and there are costs associated with your care. The majority of costs are covered by Medicare through the Medicare Benefits Scheme and the Extended Medicare Safety Net program, which reimburses between 80-90% of the cost of treatment. If you hold a current Concession Card, you will not be charged for your care. Once you and your Radiation Oncologist have decided on a treatment plan, any out-of-pockets expenses for your Radiation Therapy treatment will be explained to you by one of our Patient Navigators. Patients can access free car parking and disability parking, at the front of the radiation oncology centre, when they attend the centre for planning and treatment. If you are an international patient or not eligible for Medicare and you require radiation oncology or radiation therapy treatment, we can help by liaising with your health insurer. Our team has extensive experience working with insurers. We will contact them to determine your level of cover and liaise with Chris O’Brien Lifehouse cancer hospital medical staff for the necessary insurance documentation. If a guarantee of payment is received from your insurer prior to treatment, Chris O’Brien Lifehouse cancer hospital will invoice them directly, otherwise you are required to pay before commencing treatment. Radiation oncology patients are assured of high quality and timely treatment. International patients can call us on 02 8514 0023. 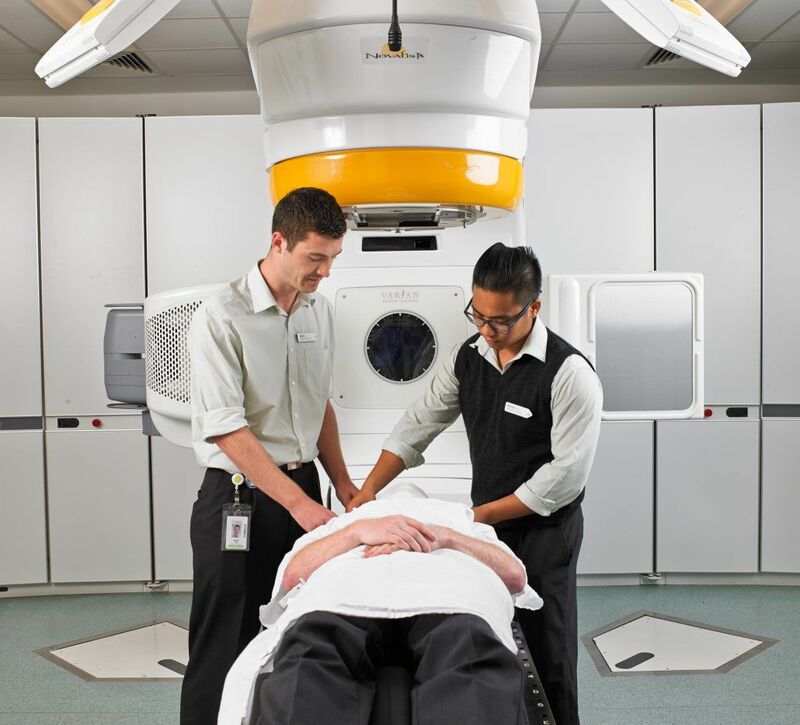 Our radiation oncology department offers a range of modern radiotherapy techniques. These include various forms of external beam radiotherapy such as intensity modulated radiation therapy (IMRT), RapidArc, stereotactic body radiation therapy (SBRT), intra-cranial stereotactic radiosurgery (SRS) / radiotherapy (SRT) and total body irradiation (TBI) as well as internally delivered radiotherapy known as brachytherapy. We also have specialised equipment to deliver superficial radiation therapy which is often used to treat skin tumours. This is the most common form of radiation therapy. The types of machines used in delivering External Beam Radiation Therapy are called Linear Accelerators. They are very accurate and precise machines that produce the radiation beam. Currently, our department consists of five linear accelerators equipped with the latest technology allowing us to deliver your radiation therapy treatment to different parts of your body. We are dedicated to the education and training of students and staff working within the department. For many health professions, clinical placements and continuing professional development are mandatory. Training periods for students assist them in demonstrating the knowledge acquired from university and help them to gain the practical skills they need to become accredited members of their profession. The department of radiation oncology is actively involved in the training of radiation therapy, physics, nursing and medical students. Students are encouraged to actively participate in daily work practices, ask questions and interact with patients. All students that train in this department work under constant supervision. During the course of your treatment, it is likely you will encounter university students participating in clinical placement. This learning period is very important to the development of clinical skills and reinforcement of university studies for these individuals. If you do not feel comfortable having a student observe, please let the staff know. The department also employs radiation therapists completing their Supervised Practice Program (SPP). The SPP program is undertaken after university study is completed, where the professional is qualified to work, but is under a thorough training program and given extra guidance. The department is also involved in the training of radiation oncology registrars, under the guidance of staff specialists. Registrars actively participate in cancer management and weekly patient review clinics. 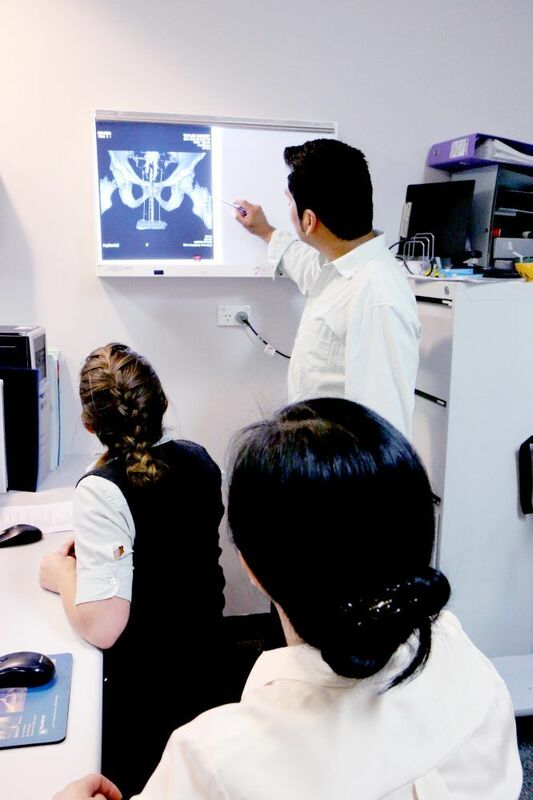 We also train medical physics trainees, under the guidance of medical physics staff. Medical physics trainees actively participate in quality assurance procedures. We are actively involved in cancer research. Research helps in the development and application of new techniques and technology. It also is used to analyse the effectiveness of current protocols and techniques. Chris O’Brien Lifehouse is located on Missenden Road, Camperdown. 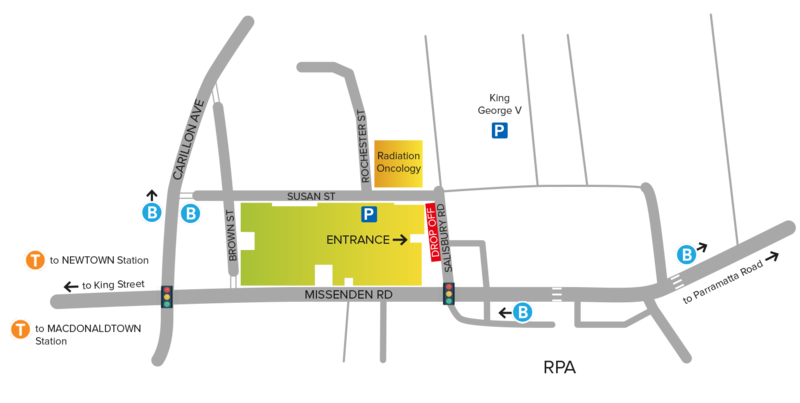 The Department of Radiation Oncology is located on Salisbury Road, Camperdown, which is situated behind the Chris O’Brien Lifehouse main building on Missenden Road. Please refer to the below.